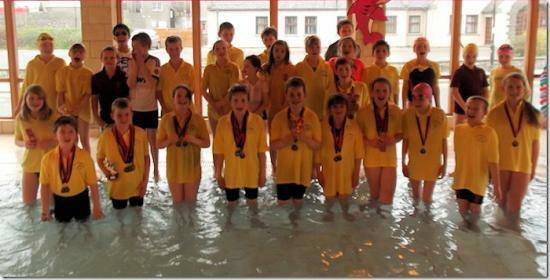 Thirty seven members of Wick Amateur Swimming Club competed recently in the Thurso Mini Meet. This meet is for 8-12 year olds. The 8-9 years girls section had Eve Watt, Lana Klimas, Abbie Bruce, Iona Fleming, Aiva Harper, Kirsty Robertson and Amy Williamson swimming for Wick. All the girls swam well, some swimming for the first time competitively. Many picked up PB's and Aiva Harper won silver in the 25m Breaststroke. The 8-9 yrs boys section had Drew Mathieson, William Mackay, Jack Crowe, Ian Cook, Sam Bullen and Mark Beveridge swimming for Wick. Again there were first time competitors and several PB's. Drew Mathieson picked up two golds in the 25m freestyle and backstroke and a silver in Backstroke, he also won his section overall which is a fantastic achievement. Ian Cook won two bronze medals in the 25m freestyle and backstroke and Sam Bullen made it a trio of medal winners with a bronze in the 25m breaststroke. The girls 10 years section had Hannah Budge, Emma Fishenden, Natalie Gow, Kirsten Gunn, Erin Hamilton, Emma Mackay, Shona Miller, Abby Munro and Carrie Robertson swimming for Wick. All swam well with several PB's and again many were competing for the first time. The boys 10 years section had two Wick swimmers, they were Harry Bartlett and Angus Henry. Again there were several PB's between the two boys and Angus won two 4th place ribbons for 50m backstroke and breaststroke. The 11years girls section again had two Wick swimmers, they were Kevagh Bremner and Sarah Harper. Sarah picked up two silver medals for 50m butterfly and backstroke and both girls had PB's. The 11 years boys section had Grant Aitkenhead, Robbie Gunn, Frank Macgregor,Ben Sinclair and Adam Williamson swimming for Wick. Grant won a bronze in the 50m butterfly, while Robbie won three silver medals for 50m backstroke, breaststroke and butterfly as well as a bronze for 50m freestyle. Ben won bronze for 50m breaststroke and three 4th place ribbons for 50m freestyle, butterfly and backstroke. Again there were several PB's by all the boys. Isla Miller was the only Wick girl in the 12 years section and swam well against tough opposition. Iain Fishenden, Max Hagan, Liam Harper, Owen Manson and Kyle Sutherland were competing in the 12 years boys section. Max won gold in the 50m breaststroke and two 4th place ribbons in the 50m backstroke and butterfly. The relays rounded off both sessions. The 200m freestyle relay for 11/12 age group was won by Wick A team who were Max Hagan, Sarah Harper, Isla Miller and Ben Sinclair and bronze was won by Wick B team who were Robbie Gunn, Kevagh Bremner, Kyle Sutherland and Erin Hamilton. Meanwhile in the younger age group the A team of Drew Mathieson, Abby Munro, Emma Fishendon and Angus Henry won Bronze medals in both the freestyle and Medley relay. High Life Highland is delighted to invite you to �get the habit of a lifetime� by taking part in our Commit to Change challenge. This brand new initiative builds on the success of our Move It To Lose It campaigns and offers people across Highland the opportunity get the habit of a lifetime by building exercise into their daily routine. Saturday saw the fastest swimmers from throughout the North of Scotland gather at the Aquadome in Inverness for the North District Sprints. The events over 50m for the four individual strokes and 100 metres for the Individual medley took the format of heats with a final contested by the fastest eight swimmers. Wick Amateur Swimming Club finished off the swimming year with a fun gala and the club championships. The fun gala was for younger swimmers just starting their swimming career and a series of fun races let them show off their new found skills and have great fun at the same time. It was a small but talented group of Wick Amateur Club swimmers who took part in the recent Elgin Mini Meet. At the 9 year old age group Darren Taylor gained more experience when he participated in three strokes which included a personal best time in his back stroke. Following the Highland schools qualifying event in Inverness, 5 Wick swimmers had qualified for the Scottish finals held recently in the 50m pool at Tollcross Leisure centre in Glasgow. This will be the venue for the swimming events during the 2014 Commonwealth games and was a great experience for the young Wick swimmers.